This July’s Together Retro title is Ikaruga, a famous shoot em up game from developer Treasure (an apt name for a developer that is highly valued by its fans, thanks to many classics such as Gunstar Heroes and Guardian Heroes). It is to some extent a spiritual sequel to Treasure’s other famous shoot em up, Radiant Silvergun (Treasure also developed a Silpheed sequel and Gradius V, and you may also count the Bangai-O series depending on how you classify it). Like Silvergun, Ikaruga has some non-trivial plot which develops during the game (and there is some relation between the plots of the two games). Ikaruga is a species of bird with parts of dark and light plumage – and also the name of a town in Japan with ancient Buddhist temples. Ikaruga inherits some characteristic features from Radiant Silvergun: for example, scoring depends extensively on continuing combos by destroying 3 like-colored enemies, and both collectables and “bombs” are absent (two features that are otherwise ubiquitous conventions of the genre). On the other hand, Ikaruga starkly distinguishes itself from its forefather with a focus on elegance and simplicity. Indeed, a couple of defining features of Silvergun – the score-based power-ups and starting the game with an impressive total of 6 distinct weapons – are replaced with no power-ups at all, and a staple fast-firing weapon (tap the button for precision single shots) complemented by a homing laser that you have to charge by absorbing enemy shots. Associated with the polarity system that is also linked to the game’s very special aesthetic, absorbing shots is in fact a defining feature of the game, and a remarkable one in a genre where the player’s expectation and natural instinct is to avoid all enemy shots. 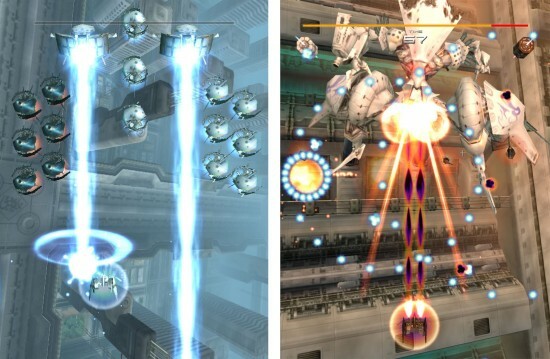 The player controls the Ikaruga, which has the unique capability of swapping between Light and Dark polarity to absorb enemy shots of the same polarity, which charges the laser (in 2-player mode, the 2nd player controls another ship called Ginkei, with the same capabilities). Shots of opposing polarity are lethal if they touch the “hitbox”. Each enemy ship comes in one of the polarities and produce only shots of that polarity. A very small number of ships (mini-bosses and bosses) have parts of different polarities. The player’s shots always damage the enemy, but by shooting ships (or parts) of opposite polarity the damage output is doubled – but this also increases the risk. Unless one is playing in Easy mode, each enemy – even relatively harmless small ships that are easy to destroy – release some additional shots when destroyed. The game is very skill intensive even though your ship can absorb shots – the stages were designed with the ability in mind and it is rare to have sections where staying in a given polarity will make you entirely safe. Indeed, the strong level design is an integral part of the game, with waves of enemies with the same polarity in multiples of 3 allowing you to keep combos going if you are extremely good at the game, although it somehow also forces you to play in very specific, rigid trajectories (there are beautiful superplay videos, including even a single person piloting both ships in 2-player mode!). Another interesting feature of the level design is that you can go through the entire game without shooting at all (if you are good enough). It is hard to say to what extent the rigid stages and gameplay mechanics forcing you to balance Light and Dark (whether you try the “pacifist” way to play or try to make perfect combos) tie together with the aesthetics and polarities reminiscent of Yin-Yang and the names of the 5 stages (which are apparently references to stages of enlightenment of Buddhism, up to the final stage “Metempsychosis” meaning transmigration of the soul). But you can certainly enjoy the game without worrying about any deep philosophy involved. to take over other nations. An organization tasked to defeat Horai called Tenkaku used their own fighter planes to try to take them down, but Horai ended up being too powerful for them. All but one man survived, he is known as Shinra. His plane was shot down near the village of Ikaruga. The villagers pulled him from the wreckage and tended to his wounds, eventually restoring him to health. They had their own fighter hidden away with the most advanced technologies available, known as the Ikaruga. Launched from the Sword of Acala, it can utilize and switch between both polarities of energy. Shinra is joined by Kagari, who was fighting for Horai, but decided to switch sides after Shinra had previously spared her life. Her ship, the Ginkei, has the exact same capability as Shinra’s, having been modified by the people of Ikaruga. Together they must seek and finish Horai for good. Ikaruga was originally developed for the arcade where it was released in 2001, specifically for the Sega NAOMI (the Naomi is roughly Dreamcast architecture with additional memory). It was soon ported to the Dreamcast (2002) but not localized for English markets, and not much later to the Gamecube (2003) – the English version however just cut the in-game text. Eventually it was re-released on the Xbox Live Arcade for the Xbox 360 (2008) with improved high resolution graphics, finally with translated text in the English version. Very recently it was also made available on Android (2013), and after a successful Greenlight campaign on Steam, it was released there in early 2014. Note that despite the better graphics and English text, some enemy patterns were changed in the Xbox re-release, and apparently tweaked again in the Steam release. Ikaruga is part of the legacy of Radiant Silvergun, and Treasure had already used a polarity system on the platformer Silhouette Mirage. Developer G.Rev also participated in the creation of Ikaruga and Gradius V, and has continued to produce other shoot em ups (including Under Defeat, released on the Dreamcast in 2006). About the time Ikaruga was re-released for the Xbox 360 (Live Arcade), there were rumours of a project “RS3”, presumably another spiritual sequel to Radiant Silvergun, but it apparently did not amount to more than wishful thinking (either by fans or possibly also by some of the devs?). Please join us on the Ikaruga forum thread for further discussion. This was one of my favorites on the Gamecube. I wish they had done a PS3 port of this, or at least an additional Mac version for the Steam release.